The quarries are natural jewels which can contain and disclose an incredible mineral richness; white mountains characterised by open cut marble mines. Graziani Marmi owns Cave del Tecchione and Cave Campanili and they manage those with consolidated working methodologies, paying attention to eco-sustainability. Natural stones of maximum brilliance and compactness and of the best level and quality; carefully chosen ones which are extracted directly from the magnificent owned quarries. A jewel of nature that offers a wide range of materials and natural stone of the best existing varieties: this is the offer of Graziani Marmi. The Tecchione quarries are renowned and known all over the world among the ones of Carrara area. They offer an excellent stone material, which have been known for centuries globally, and an unmatched naturalistic sight with dazzling white walls and many working levels built as in an amphitheatre. The marbles which are quarried here are high quality ones and Graziani Marmi is able to supply those in large quantities. The Cave Campanili are something splendid, shining with its pure white and bright rocks in the Apuan heights and they stand out in the blue sky of sunny days. They are an impressive place, majestic and rich of suggestions, one of a kind. From here it is quarried the famous and highly valued variety of Marmo Campanili, one of the most exclusive ones, used in the most ambitious projects, which only Graziani Marmi can supply directly from the quarry in large quantities. 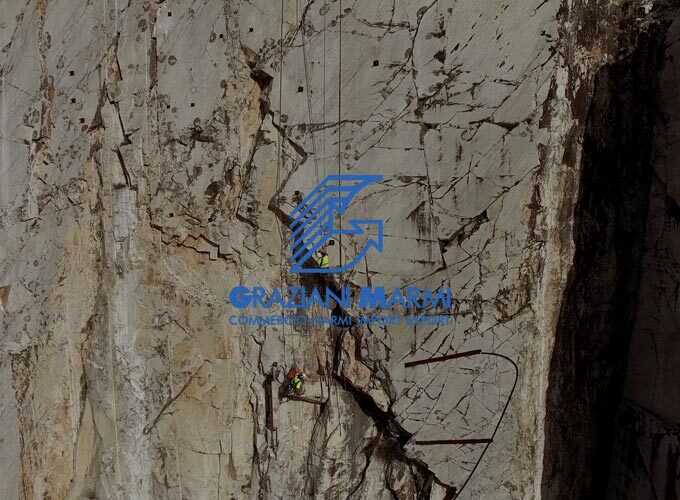 Graziani Marmi company employs expert skilled workers, among them a large team of quarrymen that have developed an exhaustive experience in the art of quarrying and processing marble and natural stone of any typologies over the years. The quarrymen know-how has been passed over for thousands of years. It is fascinating from an artistic and historical point of view, a very precious set of artisan skills and experience that nowhere apart from Carrara has developed to create expert workers who cannot be found elsewhere. The hardness and harshness of the territory have forged in those men peculiar natures reflecting the features of the marble in their character. The team of quarrymen which work for Graziani is trained to manage the work in the quarries according to safety parameters and to follow precise instructions for what concerns environment safeguarding, which are given by the management. The goal which drives the team is obtaining impeccable results in terms of process management and work precision. Graziani Marmi has an enormous warehouse of several thousands of square metres. This enormous space, in which all the blocks are gathered, has cranes and bridge cranes which move and sort through the heaviest pieces of marbles, sometimes several tons ones, with their pulley system. From here, thanks to high-skilled workers, it is managed the selection and control of the pieces, the moving of semi-finished and finished products from one department to another one and the loading and unloading area. Every day, it is here that it is carried out the sorting of blocks and slabs through their destination.